00:10:00 10 servings, 2 Tbsp. (15 mL) fondue and 1/10 dippers (56 g) each. 10 servings, 2 Tbsp. (15 mL) fondue and 1/10 dippers (56 g) each. Microwave white chocolate and cream in microwaveable bowl on MEDIUM 2 to 3 min. or until chocolate is almost melted; stir until completely melted. Stir in food colouring until well blended. Pour into serving bowl. Melt semi-sweet chocolate as directed on package; drizzle in spiral pattern over fondue. Starting at centre, use toothpick to draw line through chocolate to side of bowl; repeat to make several lines. 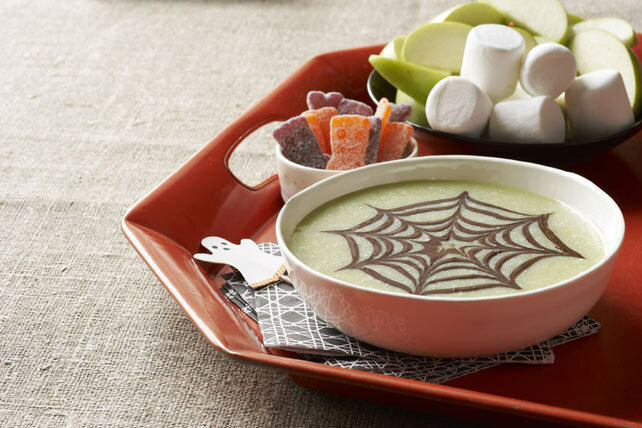 To resemble spider web, repeat but start at outside edge of bowl and draw lines through chocolate to centre. Serve with remaining ingredients as dippers. Microwave 1 unwrapped chocolate square in microwaveable bowl on HIGH 1 min., stirring after 30 sec. (The square will retain its shape.) Stir until chocolate is completely melted. Add 10 sec. for each additional chocolate square. Baker's Chocolate is specially formulated from 100% pure cocoa butter and other fine ingredients to produce decadent chocolate desserts and treats every time. Did you know that Baker's Chocolate has been in existence since 1780 and is the oldest trademark on grocery shelves? Serving Size 10 servings, 2 Tbsp. (15 mL) fondue and 1/10 dippers (56 g) each.